LILA KUHN BLINCO ’55 was eager at just 17 years of age to become a missionary. Her father urged her to take some time to reflect on that decision. Lila did her reflecting at Seattle Pacific College for one year, turned 18, and signed on with New Tribes Mission, where she spent 20 years in Venezuela helping translate the New Testament into Maquiritare. Lila married “a fellow New Triber,” worked with a second tribe, and adopted two Yanomami children. Her appetite remained strong for the liberal arts. She went back to school and eventually earned a master’s degree at the University of California, Riverside. She became a library cataloger in the UC system and learned enough of eight languages to catalog in all the languages of the collections. Now retired, she teaches a women’s Bible study at her church and visits in Spanish and Russian at a retirement home. “That one year (at Seattle Pacific) had its effect on many years,” writes Lila, “so even your ‘dropouts’ carry away a blessing!” She resides in Encinitas, California. WESLEY DODGE ’57 devoted 43 years to pastoral ministry in the Free Methodist Church of Oregon. Since 2000, he was chaplain at Warm Beach Senior Community in Stanwood, Washington, retiring just last year. His congregation for Sunday worship services, for which his wife, JOYCE NORTHRUP DODGE ’51 scheduled special music, numbered about 150. Close to 20 percent of those had ties to Seattle Pacific University. He visited residents when needed, counseled when asked, and performed marriages. Now 82, Wes says e intends to keep going “until God says, ‘It’s enough.’” The Dodges reside in the senior community they serve. G. ROGER SCHOENHALS ’61 recently published Awake, My Soul (PAPAThree Publications, 2014), a series of 102 meditations on the Apostle Paul’s letter to the Colossians available as an e-book for Kindle and Nook. “In light of the contemporary emphasis on inclusiveness, tolerance, and political correctness, Colossians boldly declares the pre-eminence of Christ,” Roger says. He and his wife, SANDRA QUANTRELL SCHOENHALS ’67, live off the grid near Leavenworth, Washington. Grace Y. Sun ’61, professor of biochemistry, retired this year from a 40-year career with the University of Missouri. Over that career, she achieved a national and international reputation in neuroscience research, with more than 270 peer-reviewed publications based on her work. Sun’s research examines how neurogenerative diseases, such as Alzheimer’s and stroke, affect the central nervous system. In June, MU honored her with Advancing Neuroscience at MU: An International Symposium in Honor of Professor Grace Y. Sun, no doubt to the delight of the many graduate students and postdoctoral scientists who have come from all over the world to seek her tutelage. Among the symposium participants was David Wong ’61, her former lab partner at Seattle Pacific and at Oregon State, where they both did graduate work. Sun is program director for the MU Alzheimer Project, project leader for the MU Center for Botanical Interaction Studies, and scientific director of the Center for Translational Neurosciences at the MU School of Medicine. 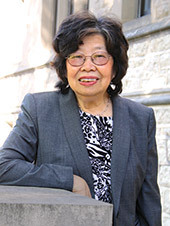 Sun received her doctorate in biochemistry from Oregon State University and conducted postdoctoral research in neurochemistry at the Cleveland Psychiatric Institute. She received National Institutes of Health funding for four decades and is the director of a successful NIH program project grant for the study of cell and animal models for Alzheimer’s disease. “I am very thankful to God that for 40 years I have had an excellent environment to carry out research in my university and that the research has been continuously funded,“ Sun says, adding that she plans to continue research in retirement. She currently studies how some botanicals — as dietary supplements — might improve brain health and be useful to combat neurodegenerative diseases such as Alzheimer’s disease and stroke. “There’s still a long way to go — but I think our research has a good future outlook for improving quality of life,” she says. BRADLEY “BRAD” HILL ’72 is senior pastor at Selah Covenant Church in Selah, Washington. A veteran missionary to the Democratic Republic of Congo (19 years), he has also served with a church in Bellingham, Washington, and at four churches in the greater Chicago area. His passions include writing and running. The psychology major lives with his family in Normandy Park, Washington. LARRY EIDE ’74 is a pastor and assistant district superintendent of the Canadian Pacific District of the Christian and Missionary Alliance. He is also the author of Leading a Life of Impact: Discovering the Path to Self-Awareness (Two Harbors Press, 2014). Each chapter includes a takeaway leadership lesson, questions to be considered by the individual or small group, and suggestions for action steps. The book is available through Amazon and Barnes & Noble. Larry lives in Blaine, Washington. KEITH HAMILTON ’84, an SPU Medallion Award honoree, has been appointed by Alaska Governor Sean Parnell to the Alaska Juvenile Justice Advisory Committee. Keith is the founding and current president of Alaska Christian College and holds a doctorate in youth and family culture from Fuller Theological seminary. He lives in Soldotna, Alaska. COURTNEY VAN DETTA GRAGER ’86 is director of congregational life at Seattle’s University Presbyterian Church. She once served as assistant pastor of worship and congregational care at San Ramon Presbyterian Church in California. In addition, Courtney served as a chaplain with the fire department and founded Deep Well Ministries, a nonprofit retreat center designed to invite women to rest with God and seek renewal. She came to UPC from First Presbyterian Church in Berkeley, California, where she was minister of congregational care and interim director of worship. The sociology major holds a master’s degree in divinity and is completing a doctorate of ministry degree, both from Fuller Theological Seminary. Courtney lives in Seattle. The losses from the massive landslide that struck Oso, Washington, in March 2014 are difficult to accept. For nearby Darrington School District, losses include two students (one the son of a teacher), a part-time custodian, a longtime school board member, and multiple relatives of students and school staff members. One way the community copes is under the strong leadership of Darrington High School Principal and Superintendent David Holmer ’67, and K–8 Principal Tracy Franke ’11. “They handle whatever comes their way,” says Barbara Cheyney, school district nurse and adjunct faculty member in Seattle Pacific University’s School of Health Sciences. 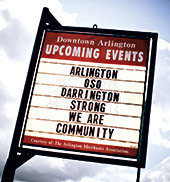 Concerned over the effects of prolonged strain on her colleagues, Barbara notes that both principals are Darrington residents, which allows them to understand and work within the local culture. “They seek out expertise from staff members for dealing with student issues and facilitate a very positive organizational structure,” she says. Neither administrator felt ready to comment for this story. A big part of their task is to collaborate with the multiple individuals and agencies involved in the slide’s aftermath. From the start, counseling resources for both students and staff members have been at the top of the list. Barbara, too, has cared for students who “were really upset and in need of hugs, talks, snacks” and sometimes just permission to go home. She made herself available to teachers and administrators feeling the terrible toll and wanting to talk out their grief and emotional exhaustion. Barbara believes her specialized skills in disaster training were providential preparation for the tragedy that befell Oso. S. BRENT RODRIGUEZ-PLATE ’90 is visiting professor at Hamilton College and writes regularly for The Huffington Post and Religion Dispatches. He is the author/editor of 11 books, including his newest, A History of Religion in 5 ½ Objects: Bringing the Spiritual to Its Senses (Beacon Press, 2014). In it, he explores the importance of physical objects and sensory experience in the practice of religion. Brent lives in Clinton, New York. LILY MORGAN ’98, who earned an SPU degree in sociology with minors in Russian and geography, is a Josephine County parole officer supervisor who also volunteers many hours as a city councilor in Grants Pass, Oregon. Despite the workload, she has been taking classes evenings and weekends to earn a master’s degree in business management this June. A devoted member of First Christian Church, she chairs the board of elders, is involved in women’s ministries, and plays the 12-string guitar. Lily lives in Grants Pass. JAMES CAMPBELL ’99 is a loan officer for 1st Security Bank in Mountlake Terrace, Washington. He has worked in both the insurance and mortgage industries and currently lives in Brier, Washington. KURT HILDEBRAND ’00 is co-director of Mennonite Central Committee in Haiti, together with his wife, Wilda Mondestin. Since the earthquake of 2010, much of the work involves continued rebuilding and aid to the homeless and to the devastated areas of Port-au-Prince, where they live. Other initiatives include human rights advocacy, education for marginalized children, and transcultural learning programs. Kurt and Wilda welcomed their first child this spring. BARTH RIEDEL ’00 is an orthopedic surgeon at Loma Linda University Medical Center. He was a member of the medical team that helped save the life of San Bernardino County Sheriff Deputy Alex Collins after a high-profile 2013 shootout with an accused killer in Big Bear, California, that received national media attention. Though Collins was shot in the face, left forearm, and left knee, and required 20 surgeries, he returned to the job just seven months later. He credits the Loma Linda doctors, including Barth who treated Collins’ arm, with his life and the ability to work again. The former soccer coach at Seattle’s Franklin High School, Barth lives with his wife, DAPHNE HONG RIEDEL ’03, in Loma Linda, California. EMILY JOHNSON ’01 has designed “Others Like Us,” a new line of apparel for Seattle’s Union Gospel Mission. OLU features hoodies, T-shirts, and hats designed to draw attention to the stories of homeless people in Seattle and help support programs in transitional housing, and emergency food and shelter. Emily lives in Seattle. DAVID VISSER ’01 is an attorney with Overcast Law Offices in Wenatchee, Washington, where he emphasizes estate planning, business issues, and commercial litigation. David also serves on local nonprofit boards at the Chelan Douglas Land Trust and at Write on the River. He lives in Wenatchee, Washington. TAMAR MAR ’02 is chief operating officer for 8of9 Consulting, a regulatory change management firm specializing in banks and other large financial institutions. She has primary oversight for operations, human resources, marketing, and contract and vendor management. Her prior experience includes teaching in South Washington County School District in Minnesota; administration at Architects of Achievement, a firm that builds bridges between educational practice and architecture; and as a field representative for Philips Oral Healthcare, where she managed a territory comprising more than 3,000 dental offices. Tamar holds a master’s degree in instruction from St. Mary’s University and lives in Mercer Island, Washington. REGAN DREW MA ’03 is an educator at Riverpoint Academy, an innovative school where students take on real-world challenges and, using an entrepreneurial design process to develop solutions, seek solutions aided by community professionals and the students’ knowledge of science, technology, engineering, and mathematics (STEM). Regan was recognized by the Paul G. Allen Family Foundation as one of their seven inaugural Allen Distinguished Educators for her work in the classroom. Regan, who also has a bachelor’s degree in political science and a master’s degree in sociology from Stanford University, received $25,000 from the Allen Foundation and a year-long fellowship program that provides strategy and network support. The former girls varsity basketball head coach, and teacher of social studies and entrepreneurship, at Mead High School in Spokane, Washington. Regan lives in Colbert, Washington. RYAN HUFFMAN ’03 is guest services coordinator for Cedar Springs Retreat Center in Sumas, Washington. The theology major lives in Sumas and invites the SPU family out for a visit. JOHN KEATLEY ’03, has again had his work chosen to appear in American Photography, one of the highest honors in the photo world. Chosen was his portrait of rapper Macklemore. In 2009, it was his portrait of photographer Annie Leibovitz, and in 2010, his portrait of Sarah Palin. John and his family live in Seattle. KATHERINE “KATIE” MARSALA KROMBEIN ’03 is an ambassador for a socially conscious fashion accessories brand called Noonday Collection. As Noonday ambassadors, women in the U.S. earn income while helping others out of poverty. Through her periodic trunk shows in people’s homes, Katie, a mother of four, shows jewelry, bags, sandals, and home accessories created by a network of artisans in 10 countries such as Ecuador, Ethiopia, and Uganda. She notes that many of the artisans use their income to provide schooling for themselves or their children. Katie and her family live in Seattle. JASON SILER ’04 is an officer in the U.S. Army. He and his wife, Micala, are involved with A Family for Every Orphan, where she serves as executive director. The organization promotes indigenous Christian adoption and foster care by helping orphans find loving Christian families in their home countries. Because of Jason’s work as a military Eurasian foreign area officer, the family has traveled and met with orphan care leaders and adoptive families in a variety of nations, including Ukraine. He serves as a U.S. military representative and advisor in U.S. embassies and has spent time in Lithuania, Kazakhstan, and Russia. Currently, Jason pursues graduate studies in international public policy at Johns Hopkins School of Advanced International Studies and lives with his family in Washington, D.C.
JESS MARIE GRIFFITH ’08, the program coordinator in SPU’s Art Center Gallery, is the owner of Pine & Boon handmade handbags and textile designs. She says her work “is informed by raw intuition, utilitarian construction, and artful details.” The fusion of those things happens in a small studio in Seattle where she sews, paints, sculpts, and collaborates. Hammers, razor blades, and an industrial sewing machine are tools of her trade. Jewelry designer MOOREA SEAL ’09 features Jess’ artistry in her Belltown store and on her website and notes that purchases of Pine & Boon support health and wellness initiatives both locally and globally. Jess lives in Seattle. DANIEL “DAN” PRICE ’08 is the youngest person ever chosen to receive the CEO Executive Excellence Award from Seattle Business magazine. The co-founder and CEO of Gravity Payments received the 2014 honors for his leadership in establishing one of the top 50 credit card processing firms in the country and for doing it in less than 10 years. Dan lives in Seattle. ANGELA BURT TUCKER ’08, disability support services coordinator in SPU’s Center for Learning, was interviewed for the BBC program “World Have Your Say” on March 27, 2014. Angela, who is adopted, found and reconciled with her birth parents. Her story is featured in the documentary Closure, which made its television debut on KCTS 9 on April 25, 2014. In the one-hour BBC program titled “Why Do We Keep Searching?” a number of adoptees who have conducted birth parent searches, including Angela, were interviewed. Angela participated by phone from Seattle, where she lives. MIKE WIERUSZ MAT ’08 has launched a sustainability engineering and design program for Seattle’s Northshore School District, winning the attention of the Paul G. Allen Family Foundation and garnering Mike honors as one of seven inaugural Allen Distinguished Educators. His students work alongside industry experts and apply their science, math, technology, engineering, and design skills to develop sustainable solutions for the planet. Mike, who also holds a mechanical engineering degree from the University of Washington, received $25,000 from the Allen Foundation and a yearlong fellowship program that provides strategy and network support. Each ADE has the opportunity to apply for additional funding to increase the scale and visibility of innovative ideas around engineering and entrepreneurship education. He lives in Seattle and says that one of his latest endeavors is designing engaging toys for his kids (3-and-a-half years, and 7 months) out of cardboard and duct tape. You can visit his website at thisisthefuture.org. CATHY WARNER MFA ’11 has published Burnt Offerings (eLectio Publishing, 2014), her first book of poetry. She is donating 10 percent of author royalties to the Orca Network to aid in educating the public about providing safe, healthy environments for the endangered southern resident killer whales in Puget Sound. Cathy is the literary editor of Image journal’s “Good Letters” blog, and with her husband employs veterans to renovate homes through their business, Yellow Ribbon Homes. She lives in Port Orchard, Washington. MOLLY MAHAN ’12 owns Gaines Structural Integration in Port Angeles, Washington. Structural Integration is a form of deep-tissue massage that in a series of 10 sessions works to re-educate the body through movement and touch for a more efficient physical system. The exercise science major is a commercial fisherwoman from Alaska. She studied deep-tissue massage methods in Colorado and Hawaii, received a diploma in Structural Integration, and hopes to go to physical therapy school. Molly lives in Port Angeles. MILES WRAY ’13 is a recurrent contributor to the blog of Ploughshares, a venerable literary magazine published in Massachusetts since 1971. The award-winning magazine has published significant contemporary American literature by authors such as Raymond Carver and Tobias Wolff. Miles has written on Usain Bolt, the world’s fastest man, and on boxing, through the eyes of Joyce Carol Oates. Miles also writes a recurring column for McSweeney’s Internet Tendency called “Reviews of Self-Help Books by Professional Athletes,” and is an assistant editor for the online literary journal Spartan. He lives in Seattle.